Quality and Speed In A 9'2" and 10'4" Machine: The new Discbine® 209 and Discbine® 210 disc mower-conditioners help you make the very highest-quality hay, and help you keep more of it. They cut crop closely, cleanly and quickly, and condition it uniformly for faster drydown, preserving nutrients. Built On A Legacy of Quality: New Holland pioneered the Haybine® mower-conditioner to save time by combining what was once a two-step process with different machines, into a single solution. Today's modern Discbine models are built on that same legacy, improved to meet your needs and offer faster mowing and effective conditioning that saves time while speeding crop drying. Takes The Worry Out of Cutting Close: The reliable MowMax system saves you worry, time, aggravation and repair costs because it's a truly modular design. Each disc module is independent, sealed in its own oil and protected from harmful impacts by exclusive ShockPRO™ hubs. Increase Tonnage with The QuickMax™ System: Sharp knives give you the clean cut you want, with less crop left behind. As a result, tonnage is increased, you get fast regrowth and forage quality is assured for next cutting. It's easy to stay sharp with the standard QuickMax™ knife change system. It allows you to quickly change damaged knives or flip an entire set to achieve that cleanly mown look that's a haymaker's pride. Higher Retained Quality Through Faster Drydown: Faster hay drying not only means beating the weather, it allows you to get crop out of the field with maximum feed quality. 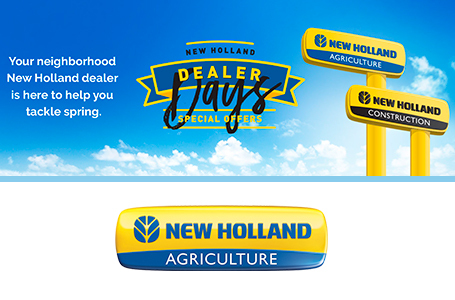 New Holland offers three effective, fast-drying conditioning solutions, including gentle rubber chevron intermeshing rolls, steel chevron rolls for added durability, and LeaningEdge™ flail tines that are ideal for grass hay. No matter the system, each offers fast, infinite adjustments to conditioning intensity to match crop and weather conditions. Productivity Sized To Your Demands: You can maneuver easily in small and oddly shaped fields with both of these nimble side-pull models. The Discbine 209, with its straight tongue and standard hitch design, is perfect for utility-size haymaking tractors. If your operation or schedule demands more acres every hour, the wider-cutting Discbine 210 decreases mowing time by up to 10%. Unlike other side-pull disc mower-conditioners, the tongue of the Disbine 209 and 210 pivots at the side of the trail frame, providing a clear view of the front of the machine while cutting hay. 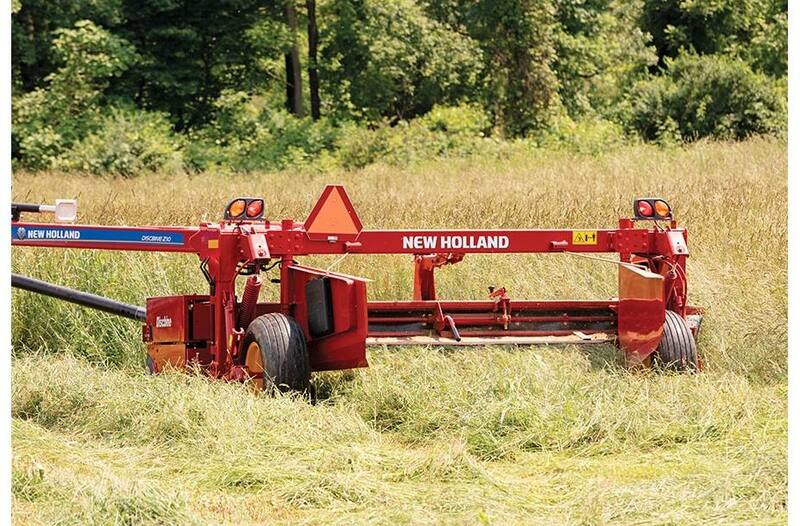 Mow Fast and Dry Fast - Bale Sooner: When the weather forecast is just right, it’s time to mow. Often the perfect haymaking window threatens to close without warning. You can’t control the weather but you can choose the tools that help you work quickly. 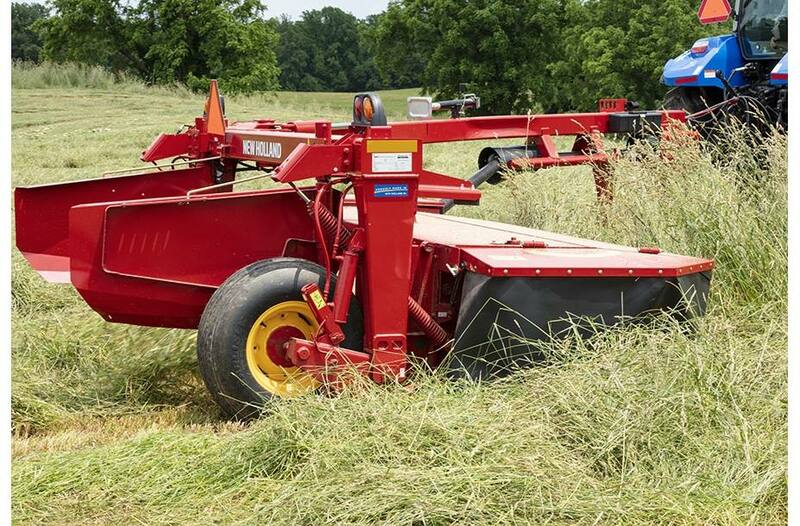 Discbine® models with the MowMax™ disc cutterbar offer fast mowing and smooth uniform crop flow to the conditioner that can help open your haymaking window. Uniform Crop Flow Delivers Consistent Conditioning and Fast Drying: When pairs of MowMax discs turn toward one another, they cut then swiftly move mown crop to the wide New Holland conditioning system. This fast, uniform crop flow results in more uniform conditioning, and well-distributed, fast-drying swaths. Other designs feature discs that rotate toward the center of the machine, throwing crop forward and moving it toward the center of the machine. These designs often result in more crop passing through the center part of the conditioner, leading to less consistent conditioning and swath formation, which can slow drying. Reliability When It's Time To Mow: The MowMax™ disc cutterbar stands apart from many others because it is designed to resist damage and minimize downtime even when the worst happens. The MowMax cutter bar uses sealed disc gearboxes, each with an independent oil sump, so it’s impossible for a loose gear tooth to damage adjacent modules. While others claim a modular disc system, their gear cases are segmented and the assembly shares a common or interconnected oil sump, allowing the possibility of internal damage to affect adjacent segments. Your Continued Peace of Mind Is Part of The Design: Not only does the MowMax™ cutterbar slice smoothly through difficult crops, it gives you the security that comes from built-in impact protection and simple maintenance. Expect The Unexpected. Never Let It Slow You Down: Uneven ground and unexpected field obstacles are a fact of life, but there’s no need to worry because Discbine mower-conditioners feature New Holland’s ShockPRO™ disc drive hubs. They protect disc drive modules before damage occurs and are quick to replace if needed. Here’s how it works: when a disc encounters an obstruction, the partially splined hub is designed to shear, protecting the cutterbar drive. The shearing action is external of the module oil sump, with no risk of contamination. A stack of washers acts like a slip clutch to assure reliable positive drive and keep everything firmly fitted to prevent damage to adjacent discs, giving you time to stop and replace the single, damaged hub with minimum cost and interruption. Reliable and Strong Protection Starts Out Front: New Holland rock guards absorb and dissipate the force of a direct collision from their position just ahead of the discs. Their heavy-duty, ductile cast-iron construction means they will not bend or distort with repeated impacts for continued cutterbar protection. As the cutterbar moves over the ground, the suspension system protects the cutterbar by allowing the header to move up and back, absorbing impacts. As the header raises, the weight remains relatively unchanged, protecting the head through its working range. Cleanly Cut All of Your Crop, Even Over Uneven Terrain: The Discbine header closely follows changing ground contours since it is suspended independently from the trail frame, so you get clean, smooth cutting, with reduced stubble damage and skid shoe wear. 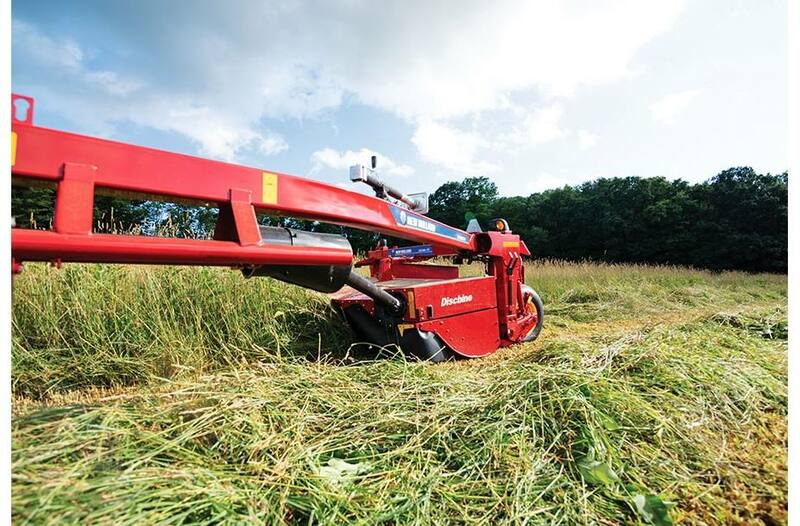 Respond To Changes with Full Control of Cutting Height and Angle: You can tip the disc header back on-the-fly to protect the knives using the standard Discbine 210 hydraulic header tilt. It’s integrated into the lift circuit, without the need for a third remote. The hydraulic cylinder first tips the disc head back before lifting the head. When conditions improve, place the tractor’s remote valve into the float position and the head will automatically resume your preset height. The hydraulic header tilt option is also available for the Discbine 209 without the need for a third remote. Set The Height You Like: It’s easy to set cutting height using the provided travel-limiting pin. For the highest cut height, insert the pin into the rearmost hole. For the low setting, remove the pin and store it on the cylinder, and the head moves through the full tilt range. While many competitors use turnbuckles that can rust and seize, the Discbine travel-limiting, four-position pin means haymakers can quickly set their cutting height to crops and conditions. For the best performance, operate headland lift in the float position, and the flotation system allows the head to tip back to adapt to terrain. No-Hassle Access That Saves Time: Heavy-duty steel shielding protects the operator during use, yet it opens wide with the tongue in any position and latches open to reveal nearly the full width of the cutterbar. That makes periodic maintenance like blade changing even easier. The front steel hood is fitted with a poly impact liner that resists dents, so your mower keeps looking good. Others may claim large, wide-opening hoods but you’ll find they don’t compare to the accessibility of a genuine Discbine® disc mower-conditioner. Save Time and Mow Better with The QuickMax™ Knife Change System: When you use sharp knives, you get a smooth finish, add tons to your harvest and improve the cut quality of future cuttings. With the QuickMax™ system, a special knife tool allows you to change bent or dull knives in less time than getting out of the tractor, so you save time and crop. Fast Crop Drying with Three Flexible, Wide-Dry™ Conditioning Choices: Whether you’re mowing alfalfa, clover, orchard grass, timothy, bermuda grass, bahia, grass, fescue, cereal rye, forage wheat or oats, the Discbine® 209 and Discbine® 210 harvest crops quickly and produce nutritious, high-value feed using your choice of conditioning systems. Both hay mowers give you the choice of gentle, effective conditioning with rubber chevron-intermeshing or LeaningEdge™ flail tines for fast grass hay drying. The model Discbine 210 offers the added choice of steel chevron-intermeshing rolls. No matter the system, each offers fast, infinite adjustments to conditioning intensity to match crop and weather conditions. Adapt To Changing Conditions and Seasons: Every New Holland conditioning system gives you flexibility to tailor conditioning intensity to match your crop needs, with performance that has been validated by independent university review. 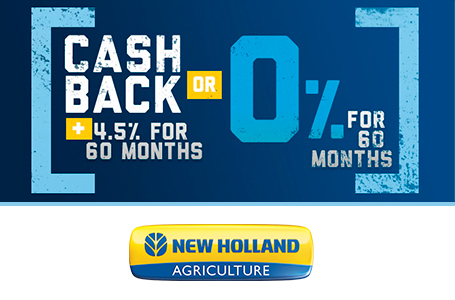 From the adjustable torsion-bar roll-pressure system to easy flail tine conditioning adjustments, New Holland provides haymakers with the right conditioner and level of intensity for fast drying and high retained forage quality. Superior Drydown and Non-Stop Mowing: New Holland rolls provide uniform stem crushing and cracking that speeds drying. The unique and proven torsion-bar system delivers constant roll pressure that balances pressure across the rolls for even conditioning. And, crop slugs won’t slow you down because a release mechanism momentarily reduces roll pressure to allow slugs and obstructions to pass automatically for non-stop mowing. Adjust Roll Pressure At A Single Point Without Tools: Since adjusting to crops and conditions is essential for consistent conditioning, New Holland makes adjustment as simple as it gets with a turn of a crank at a single location. No need to make adjustments at both sides. No wrenches needed. Gentle Handling of Leaves with Chevron Rubber Intermeshing Rolls: With spring moisture, early-season crops present challenging drying conditions. For delicate grass, clover, and alfalfa crops, gentle New Holland chevron rubber intermeshing rolls offer you the greatest versatility. The rubber compound helps to grip slick crops and the broad chevron lugs scuff, crush, and crimp stems, quickly releasing stem moisture for faster drydown. An independent university study concludes chevron rubber rolls produce faster-drying alfalfa swaths in both first and second crops when compared with steel rolls or flail tine systems. For Abrasive Conditions, Choose More Durable Steel Rolls (Discbine® 210 Only): You’ll get extended wear from New Holland chevron all-steel intermeshing rolls. The aggressive steel lug design is ideal for tall robust stemmed grasses, heavy forage crops, and even sorghum. The pointed steel roll lugs grip these difficult crops then smoothly feed them, crimping and cracking the stem. In the most difficult crops and field conditions, the all-steel roll design resists abrasion while providing effective conditioning to speed drying. 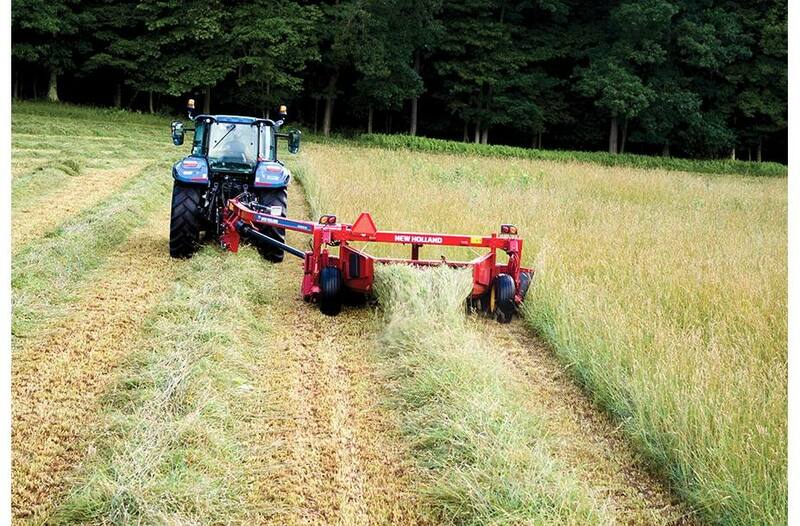 Faster Drying of Grass Crops with LeaningEdge™ Flail Tines: Grass hay producers know that crushing and crimping fine stem grass is a real challenge. For fast drying of coastal and other fine grass, the New Holland LeaningEdge™ flail tine conditioning system pushes crop against an adjustable hood that scuffs wax away. Crop receives even more scuffing action since New Holland flail tines are angled rearward to create more outward crop pressure against the hood. You can adjust the conditioning hood position with a single crank and use the provided crop-conditioning gauge to see the relative hood position. 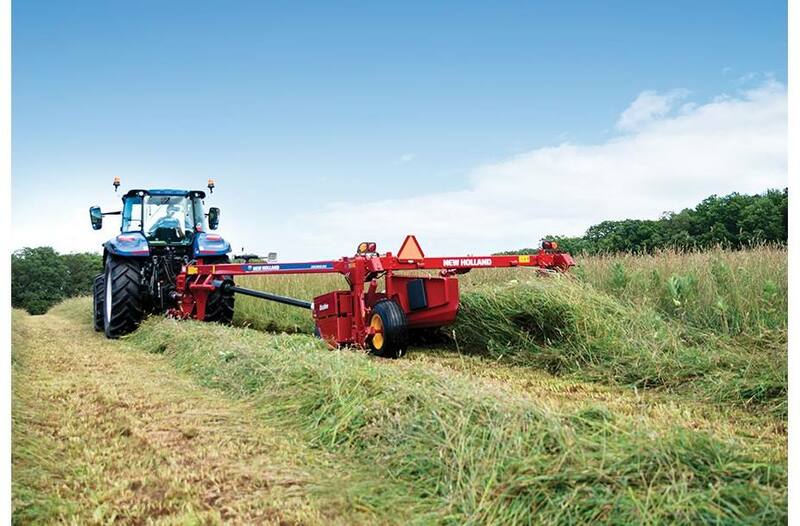 Designed For Fast Drying and Reliable Conditioning: You can expect well-formed, fast-drying, windrows or swaths using the LeaningEdge flail tine system. Crop flows smoothly because tines are prevented from overswinging like a fixed tine when crop is released. For protection, the tines are free to swing back to allow obstructions to pass. Perfectly Shaped Wide Swaths or Windrows To Match Your Drying Needs: The full-width swath board and two swath doors allow you to create fast-drying wide swaths, well-shaped, three-foot-wide windrows, or any setting in between. If conditions are right, New Holland Wide-Dry™ conditioners let you choose a fast drying wide swath, or switch to a smooth windrow if conditions change. Get Mowing Fast: New Holland’s standard Discbine 209 and 210 hitches attach fast with a traditional hitch pin, PTO shaft, a lighting plug, and always just two remotes. NO complicated hitch extensions here. When the sun shines it’s time to make hay, so hook up and get to mowing. Mow Quickly with Confidence: Unlike other disc mower-conditioner designs, the Discbine 209 and 210 tongues each pivot at the side of the trail frame. 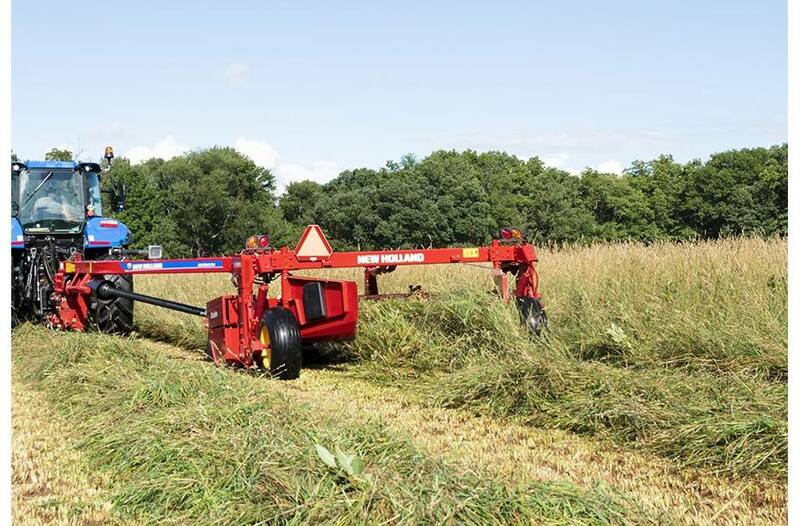 When mowing quickly, the design allows operators to maintain a clear line of sight to the machine to monitor cutting and look out for dangers in the hay. Headland Turns, Expertly Mown: Simple headland turns and well-shaped, clean-cut corners are standard with every New Holland Discbine model. Productivity means saving time at every step and the curved tongue of the Discbine 210 offers exceptional tire clearance through the tightest headland turns for expertly mown corners. The constant velocity driveline provides chatter-free turns and the curved tongue design maintains the driveline angle as straight as possible while mowing, reducing driveline wear and tear. Worry-Free Turning As Sharp As You Want: Every farm has those small fields, triangles or areas that are just plain odd. Every acre counts so take the stress out of difficult turns with the optional swivel hitch for Discbine 210 disc mowers. Compared to traditional hitches that pivot on the drawbar, the pivoting action of a swivel hitch is moved rearward, behind the PTO at the swivel gearbox. No matter how sharp the turn, the PTO will remain straight which virtually eliminates PTO wear, and there is never risk of a collision between the PTO and tractor lift arm. This high-reliability swivel hitch option is available with your choice of drawbar or two-point attachment. Speed rpm: 718 std. 1000 opt.